Theme > Epic > Item (Story /Requirement / Improvement / Task /Bug) > Subtask. Note: 'Theme' and 'Epic' terms can be changed in Product Settings > Product terminology. Subtasks inherit their parent item's Initiative, Goal, and Container. And they cannot be changed on subtask level. 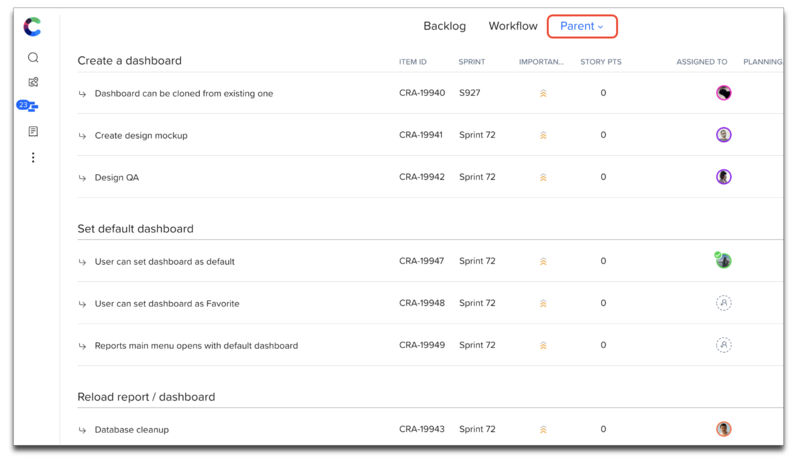 Subtasks also inherit their parent item's Sprint, but it can be changed on subtask level later if needed. Subtasks are released/unreleased only when their parent items are released/unreleased. Open an item and click '+ Subtask' under description. Or select Add Subtask from item's 3-dots menu which appears when you hover over item's icon. 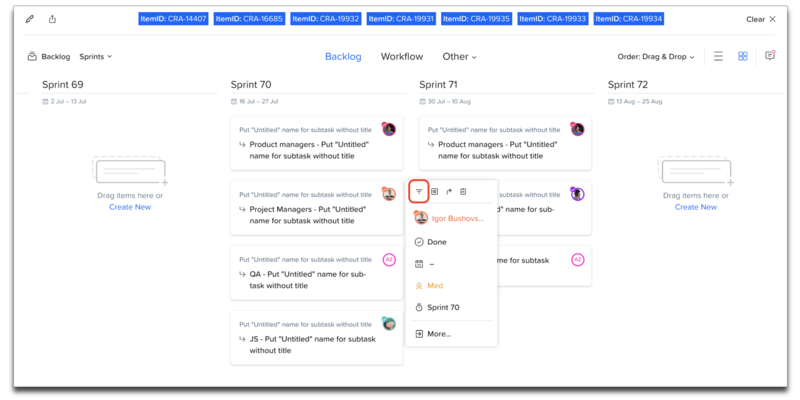 Create as many subtasks as you need. After that you can open a subtask by clicking the arrow icon which appears when you hover the cursor over subtask. In subtask view, you can add a subtask description, attachment, related items, and edit subtask properties. To assign subtask to a team or a team member, click Assignee icon next to the subtask title. 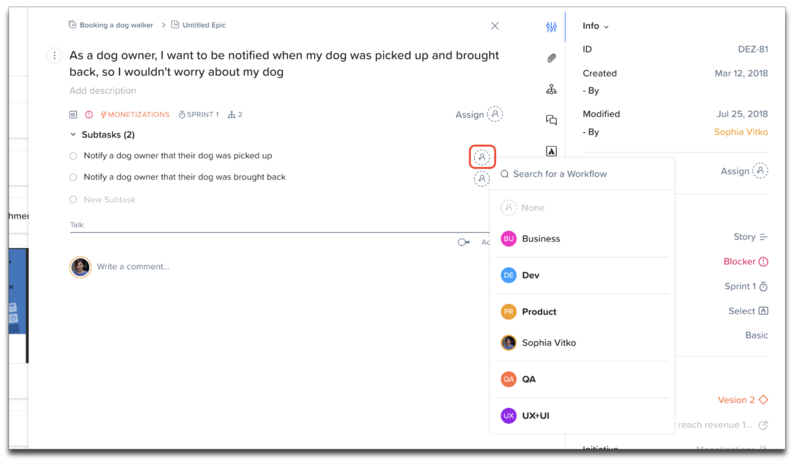 After assigning subtask to a person or team, you will see workflow statuses of this team. You can pick a status or leave default To Do status by clicking outside the dropdown. As any other item, subtask also can be assigned in its Properties panel, as well as on List and Cards views. Subtask status can be changed from Assignee dropdown as in any other item. Additionally, on parent item level, one can quickly change subtask completion state by selecting a checkbox before the subtask. Unselecting subtask checkbox returns subtask to its previous status. To add subtask Estimated and Actual Time, go to subtask properties panel and scroll to the Work Log tab. You can also set Story Points and duration (Dates) on subtask level. 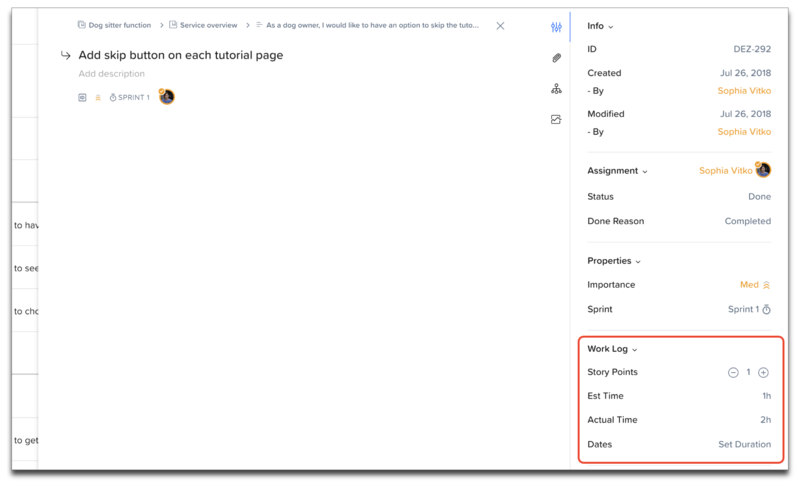 On subtasks parent item, you can see Work Log based on subtasks, which is the sum of subtasks Story Points, Estimated and Actual Time, and Dates aggregating subtasks earliest start date and latest end date. In Items - List view, select Parent column to by displayed it in the table. It shows subtasks parent item. You can also group entire list by Parent by selecting Other > Parent. To view a particular selection as Epic, Container, Sprint, etc., filter the list via Search. In Items - Cards view, you can filter items via clicking the filter icon from mini properties panel of any item. This will display only a parent and its subtasks. To unselect filtering, click Close button on the right side of the upper filter bar. 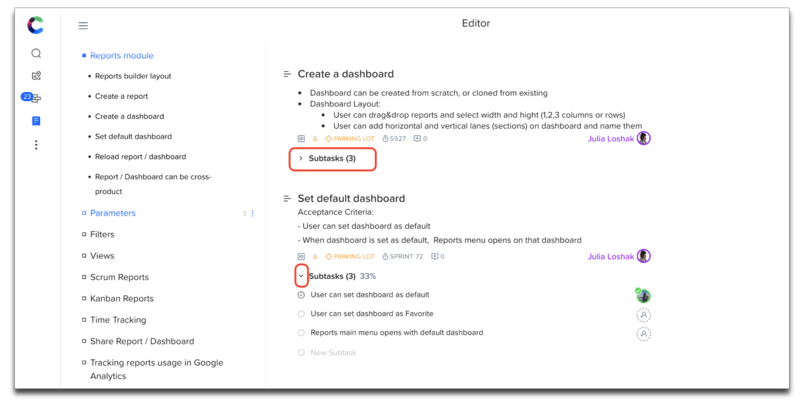 In Editor, subtasks are collapsed by default. Click Subtasks section to expand it. You can add/edit and assign subtasks here as well. To search for Subtask item type, click Search, select Type modifier and click Subtask. 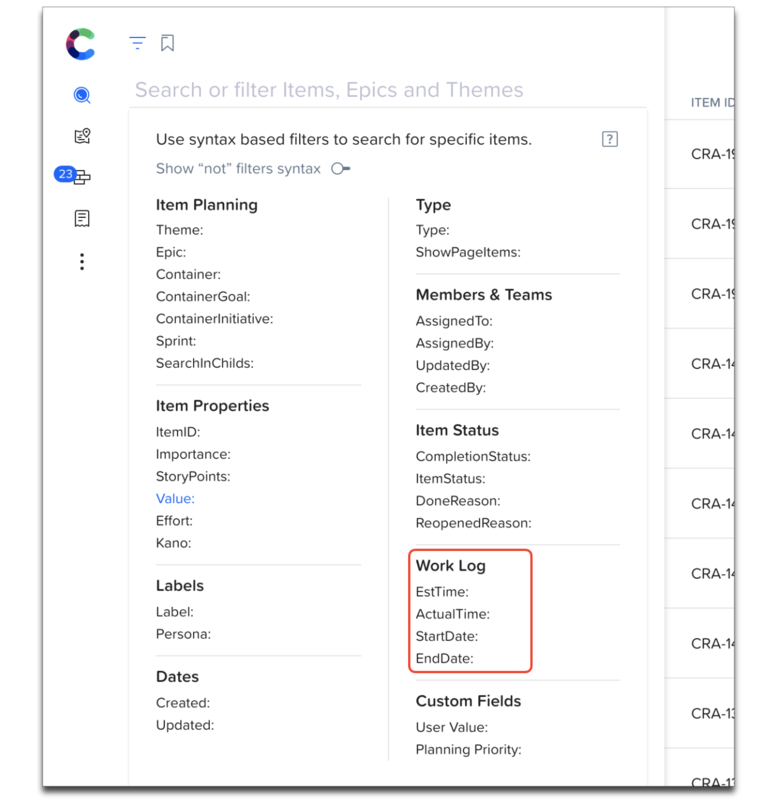 To search by Work Log parameters (either for subtasks or parent items), select the following search modifiers: EstTime, ActualTime, StartDate, or EndDate. If you want to filter out subtasks, select Type-Not in Search panel, and click Subtask.